Salt. Its appeal comes from the fact that it intensifies all flavors and enhances them more than any other ingredient. It also heightens our perception of sweetness and sourness while minimizing bitterness—a quality that balances the flavor of everything from grapefruit to coffee. Traditionally, native Hawaiians used salt or pa‘akai (to solidify the sea) to season and preserve food, for religious and ceremonial purposes and as medicine. Preserving fish and other seafood was also vital, especially to provide sustenance during long ocean voyages. Hawaiians were the only Polynesians who produced salt from seawater using properly constructed clay pans. Those early Hawaiians had just three condiments to season their food: seaweed, kukui nut, and salt. Not unlike grapes, the character of salt is built on terroir—the unique aspects of a region that influence and shape its creation. In this particular case, it includes the sea from which it originates, the soil that it’s dried upon, the climatic conditions of the locale, and the culture of the people who harvest it, in addition to meroir—how the specific water of a region affects the taste of a food. One of the first salt ponds, more than 1,000 years old, is on Kaua‘i, in the ahupua‘a (watershed) of Hanapepe, and is blessed with the pristine conditions of a site that encompasses both terroir and meroir. 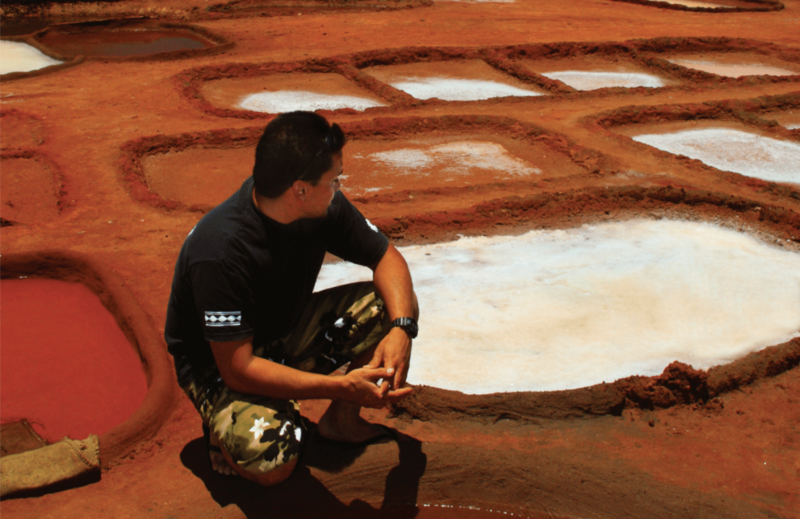 The families of Hanapepe have carried on the tradition of salt making following the same techniques as their kupuna (elders) for hundreds of years. Today, there are some 20-plus families who have been granted the rights to harvest salt in Hanapepe by the State of Hawai‘i. This traditional process is what makes Hanapepe salt unique. In Hanapepe, salt is created by accessing underground salt water from a source in the form of a hand-dug well, or punawai. These wells average eight feet deep and four feet wide. Salt water travels from the ocean through underground lava tubes and fills the wells. The salinity of the water in these wells is about two- and-a-half times that of the ocean. The water is then poured—via bucket—from the punawai into shallow holding clay beds or waiku, where it becomes concentrated and left for eight to 10 days, depending on the weather. This water is then transferred to clay drying pans, or punee. It is here that the salt begins to crystalize and forms layers of snow-white salt. This top layer of white salt is raked, drained, and dried. This is used as table salt/finishing salt. Each of these families has a place on Kaua‘i where they collect their own red (edible) clay called ‘alaea, which gets its hue from iron oxide. This red clay is then added to the white salt. It’s this added process that gives Hanapepe salt its distinctive appearance and flavor. Much as the Hanapepe pa‘akai is sought after by those in-the- know, it is not for sale anywhere in the world. Instead, the salt-harvesting families in the group Hui Hana Pa‘akai uphold the inherited concept of communal stewardship—the salt may only be given or traded, but not sold. If you want a taste of this delightful pa‘akai, ask around those with a Hawaiian connection. Chances are, they may be able to obtain these coveted crystals from friends and/or family. Once you sample it, there’s no going back.